Israel’s history demonstrates clearly that Israel is a perpetual warmongering terrorist state since its illegal inception. Through an elitist, supremacist, racist and genocidal path a majority of world Jewry had been brainwashed to adopt the terrorist Zionist ideology. This ideology had led Jewish terrorist groups to perpetrate hundreds of genocidal crimes against peaceful Palestinian villagers, totally wiping their towns off the world map, ethnically cleansing 800,000 Palestinians out of their homeland and establishing the terrorist state of Israel, that has, and is still violating hundreds of UNSC resolutions, waging wars of terrorism and aggression against its Arab neighbors, and is perpetrating war crimes and crimes against humanity against Palestinian civilians, last of which was the deliberate murder of 63 civilian peaceful Palestinian demonstrators and the severe wounding of 3000 others in mere one day of Monday May 14th. The Palestinian masses had organized peaceful demonstrations called “March of Return” that started on March 30th in commemoration of Palestinian Land Day, until May 15th; the Nakbah Day. The Land Day is a yearly commemoration of the 1976 Palestinian protest as one whole nation all over Palestine against the Israeli illegal confiscation of Palestinian land in the occupied Galilee. The Nakbah (catastrophe) commemorates the Israeli genocide of Palestinians and the Israeli occupation of their homeland. The demonstration came also as a rejection of Trump’s illegal announcement and recognition of al-Quds as Israel’s capital. The label “March of Return” is meant to remind the whole world of UNSC 194 that gives the Palestinian refugees the right to return to their homes and towns. Throughout the last 70 years Palestinians had resisted the Israeli occupation in many different forms; militarily and peacefully. Unfortunately, due to the financial influence of the World Zionist Organization and the political pressure of successive American administrations the international political and humanitarian organizations and the Arab League had failed the Palestinians and offered nothing to help them gain back their rightful homeland and to establish their sovereign state. On the contrary, while granting Israelis; the aggressors, the false claim of the right of self-defense there was no mention of Palestinians’ right of self-defense. While overlooking and staying dump silent about all the Israelis’ violations of international laws and all their crimes against Palestinians especially the flagrant genocide of two million Palestinians in the largest ever open prison of Gaza, these international organizations would blame the slightest Palestinian rightful resisting act to stay alive and brand them as terrorists. Finally, the Palestinians; those starving in Gaza Strip joined with those oppressed in the West Bank and in 1948 occupied Palestine, orchestrated the March of Return as a peaceful political statement about their political and humanitarian rights. This week Palestinians in Lebanon had also joined in the march towards the border with occupied Palestine. 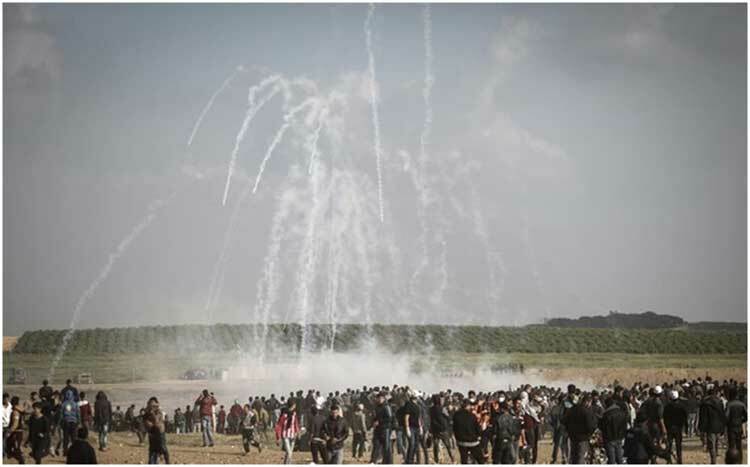 Since the beginning of the March of Return; March 30th, until today Israeli army with 100 snipers on Gaza border had intentionally and deliberately murdered 116 peacefully demonstrating Palestinians and wounded more than 12,000 others including press reporters and medics. They have used tear and chemical gas, rubber coated bullets, and exploding hollow-pointed bullets to perpetrate yet a new massacre against Palestinians. This massacre reflects the terrorist nature of Israel. Israel was founded on terror and genocide against Arabs especially against Palestinians. Israel had attacked Jordan, Lebanon, Egypt and Syria. Israeli agents had assassinated Palestinian activists and scientist all over the world including European and American cities. Israel had rejected and violated every Arab peace initiative although Palestinians gave up 78% of their homeland and recognized the state of Israel. Successive Israeli governments were not satisfied with mere control over Palestinian Authority, its financial budget, its security apparatus, and controlling all Palestinian taxations and banking they became more aggressive in confiscating more Palestinian land, destroying their homes, targeting their children and imprisoning their activists. It seems that the international community is terrorized by and complicit to Israeli terrorism. The latest Israeli massacre of 116 Palestinians did not inflame any humanitarian response from the international community besides expressing concern, calling for self-constraint, asserting Israel’s right for self-defense and calling for the Israeli-rejected and impractical two-state delusion. On the other hand, we witnessed few weeks ago US, UK and France bombing Syria under the justification of protecting civilians from any chemical weapon attacks. Also, we have witnessed many Western countries expelling 100 Russian diplomats for the alleged Russian poisoning of Russian double-agent Sergei Skripal although no death was inflicted. In the Palestinian case we did not witness any bombing of Israeli targets or any expelling of Israeli diplomats, besides Turkey. On the contrary some Arab states seem to join Israel’s celebration of their occupation of Palestine (the so-called Israel’s independence day) such as Egypt, while others like Saudi Arabia, Bahrain and UAE had blamed Hamas for sending Palestinian youth to their wasteful deaths. The international community is terrorized by the Israeli “Sampson Option”; the Israeli threat to bomb western capitals with nuclear bombs. They know that Israeli government is a rogue state who does not respect any international law and has utter contempt towards all human lives other than their own. Besides attacking their Arab neighbors Israelis had perpetrated false-flag attacks in European and south American capitals, sabotaged the Japanese nuclear reactors, pirated the humanitarian Gaza aid flotilla, caused economic collapses through their control of the IMF and Federal Reserve, perpetrated 911 attack, and forced US to impose economic sanctions and attack other countries as punishment for countries who dare to recognize Palestinian rights or to speak against Israel. The Middle Eastern region had been a boiling pot of perpetual wars since the illegal inception in its heart. The main goal of the Zionist project is the establishment of an elitist Jewish Greater Israel on the ruins of all Arab states and the genocide of their Arab nations, and the elimination of any regional power in the area; Iran and Turkey, that may pose any slightest threat. Palestinian resistance is the first obstacle against the establishment of Palestine as the Zionist launching pad for their project. Perpetual wars, destruction, chaos and genocides are the future destiny for the Middle Eastern states unless the Israelis are ejected out of Palestine back to their original countries they came from, the Palestinians regain their homeland and establish their state that could be a seed for a strong flourishing United Arab States that could maintain prosperous peace. As could be clearly seen throughout the last 70 years, Israel has only genocide for the Palestinians. Oppressed, ostracized, ethnically cleansed, starved and left to die in the world largest concentration prisons Palestinians, who had adopted peaceful methods for the last two generations but was met with Israeli intransigence and brutal force, are left now without any other option but to resort to the same brutal methods Israel has perpetrated against them; greater force against force, and extreme terror against terror. Dying wastefully anyway, Palestinian young generations need instead to replace their passive ineffective leadership with a more patriotic younger leaders and follow the path of aggressive military resistance so that their lives would have a meaning rather than being wasted by Israeli bullets. Hezbollah fighters, who strike fear in the hearts of Israelis, are good example for Palestinians to follow. Peace in the Middle East has no chance while Israel occupies Palestine for Israeli religion, mentality and psychology are anti-human (anti-goyim). It is not the whole world against Israel as they keep on claiming, rather its is Israel against the whole “unchosen” world.